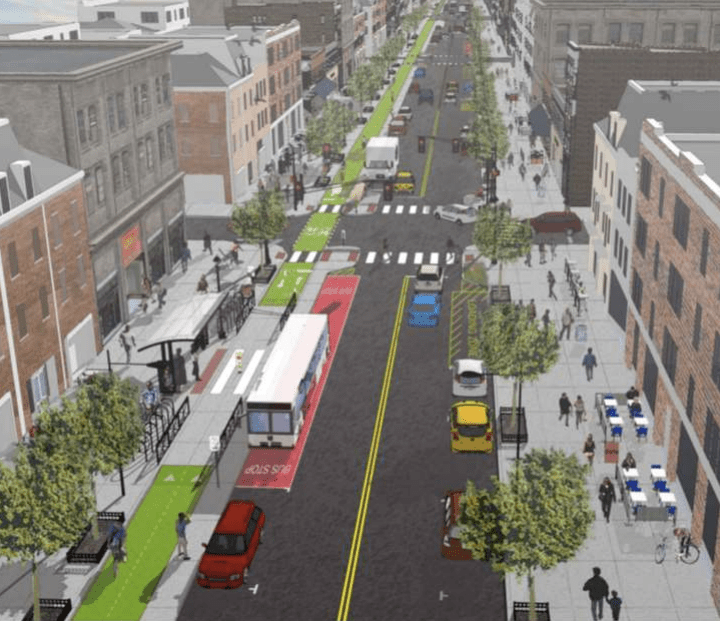 Hoboken Mayor Dawn Zimmer has unveiled a plan to transform Washington Street, the Square Mile City’s main drag, with a two-way protected bike lane, super-sized curb extensions, and bus bulbs. The plan also includes expanded loading zones, new seating, bike racks, and bioswales for stormwater runoff. The final design concept [PDF] was released at a meeting Tuesday night, capping nearly a year of public meetings and planning by the city and consultant The RBA Group. Combined with other projects underway, a protected bikeway along the Washington Street commercial strip from the PATH station to the city’s northern edge could transform cycling in Hoboken. 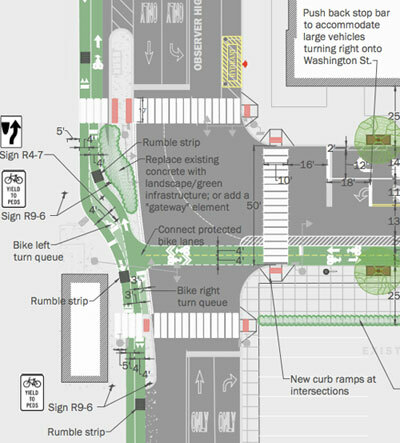 At its southern end, the Washington Street plan connects to Observer Highway, a four-lane street soon to receive a road diet and half-mile two-way protected bike lane [PDF]. Planning for that project dates to 2010, and the city says contracts for construction will go out to bid soon. At the intersection of Washington and Observer Highway, the two-way bike paths will meet at a “T” intersection featuring dedicated space for cyclists to queue up before turning onto Washington. The path continues up the east side of Washington with a concrete buffer between cyclists and parked cars until 8th Street. The remaining seven blocks, between 8th and 15th Streets, will have a protected bike lane only for northbound traffic, however, while southbound cyclists would use shared lane markings. The change was made in part to maximize on-street parking. South of 8th Street, Washington has parallel parking. The design north of 8th creates more space for angled back-in parking. Today, there are 555 parking spots on Washington Street; the consultant estimates the redesign will result in a net loss of 2 or 3 percent of those spaces. The street will also feature larger loading zones, which the city is adding to cut down on double parking. Changes to signal timing are expected to boost average motorist speeds from 6-8 mph to 8-12 mph. The Washington Street redesign also features bus stops along the protected bike path, including some where the bus shelter is located in the parking lane between the bike lane and moving lanes. Curb extensions will cut crossing distances by nearly half, from 50 feet to 26 feet, at intersections. The added sidewalk space will be used for new seating, bike racks, and bike-share stations. The entire project is estimated to cost $14 million. Final design and additional pre-construction work, such as coordinating with utilities, is expected to take up to a year. The city will be applying to New Jersey DOT and the federal TIGER program to help fund construction, which is expected to take an additional 12 months. This is all great and I’m glad to see them taking these steps, but honestly I’d rather see dedicated bus lanes on Washington than a protected bike lane. I’m sure space is an issue, but that would serve a greater number of people. You could put the bike lane on an adjacent street. Of course I don’t live there, so I’d be interested to hear what others who do think. Don’t want to overpromise or raise false hopes, but streetcars may be advanced as part of the mix. If that occurs, your wish for a dedicated transit lane, including buses, may — might —become a viable pursuit. Thank you for putting the idea out there. They should help fund construction by allowing property owners to build up to 6 stories instead of the standard 3-5. Awesome! I wouldn’t be surprised if within 5 years they get rid of some parking so that the protected lane can be continued further. In the long run that may not end up being the case. But Where are the Streetcars? This is 2014, isn’t it? I live on Washington St and commute by bike. Currently Washington St is an absolute nightmare to ride on. The pavement is horrendous and you are squeezed between traffic and parked cars that might back into you at any moment. I absolutely can’t wait for these changes. According to the article, you have more than two years to wait. A well-designed PBL can allow the passage of a lot of bicycles. If it’s wide enough for opposing groups to comfortably ride two-abreast, no bus lane would be able to touch the amount of people who could move through the corridor at a time. Wait, so is the whole cycletrack only going to be 8′ wide? That’s far too narrow for a two-way facility. Minimum should be 12′ and 14′ sounds even better. Skinny up other stuff like those islands or whatever needs to be done to give more space. Especially through the intersection area. Definitely use angled curbing too.. From what I can see, it looks like the best part about the design is probably that it allows riders going straight to avoid having to stop for no reason at the T-intersection. It’s a start, but they don’t need to leave the drawing board yet. This can’t seriously be the final design, can it? A cycletrack only 8′ is barely adequate for traffic going one direction. It’s unacceptable for a bidirectional track. Much space is wasted with those islands between the cycletracks and the parked cars. Make them way smaller, the room is far better used by the bikes. Also, curbs need to be 45-degree angled, not straight. The current cliffs proposed are inadequate. Best thing they have going here is that riders can bypass the traffic signals at the T-intersection. But even that success is marred by how narrow the left turn waiting area is. Finally, what’s the design speed? If it’s less than 20 MPH, they’ve still got a lot of work to be done. Definitely a start, but it needs lots of refinement. And you don’t ride a bicycle in the lane like a driver because …? Because…I’d rather ride on another street with less traffic and fewer potholes. Could be longer than that. It still needs to get through city council. But thanks for the heads up! It would be cheaper for.them to fix the potholes and then use the full lane. It’s not necessary to allow yourself to be squeezed on any street and controlling the lane gives you more room to maneuver around any problems in the pavement. Who’s the brainiac that put a rumble strip in a bike facility? One that cyclists will simply avoid by riding in the left lanes, creating the potential for head on conflicts. Cyclists avoid the rumble strips in Brooklyn Promenade pathway by riding in the pedestrian area all the time when I was last there. Take a close look at the bus shelter where there will be two-way cycletracks as seen on the one rendering. I simply don’t understand why they didn’t run the cycle-track behind the bus shelter. If you are waiting for the bus, where are you going to stand??? – Rumble Strips. I want to hit the person putting them on this design. – Lack of physical protection from in the form of a concrete island for pedestrians and bicyclists on the road west on the lower picture. The first 20′ or so of the dashed cycle path “protection” should be in raised concrete. And the sloping corner of that Washington St. curb and west road bike path should be a 90 degree angle to signal that turning cars can not drive into the bike path (the corner is unneccessary seeing as the DOT will have confidence that the seperate bi-directional bike path on Washington will have such a high standard all cyclists want to use them. Even then, vehicular cyclists would be able to take the 90 angle without too much problems). – That bus stop. I mean seriously? You must be joking. PLENTY of space to put a nice curved bike path around a curbside bus stop. Now you’re slowing down cyclists AND pedestrians. Furthermore the lane widths still look American Style XXL. They could be made a bit narrower, and the bike lanes a bit wider. That would make it safer for all road users, and more pleasant for bicyclists. But maybe that’s not possible, I’m not sure. Good point, I forgot about that. That’s definitely a recipe for disaster, especially if the stop is any sort of busy. No, this is horrific and that’s precisely because it’s not a Dutch (or Danish) design. The worst part about it is people calling it “a new standard for complete streets”. Maybe in concept, but the implementation is outrageously inadequate for all but the most basic of bike users and minimal of use. Building something like this is a good way to create something that bike riders won’t use and people will point to as being “waste”, all because it’s chronically underbuilt. If this is to be a main route through town (and connect to others), the cycletrack should be at least 50% wider the whole way through and not including the left turn queue space. That is by far the most crucial element, though wrapping around the bus stop is a close second. It might be time for the city to bite the bullet and take out a through lane if necessary to get the space. But the present implementation is woefully inadequate. So how do you suggest slowing bikes down enough to ensure they can yield to any pedestrians present? Yeah, it does make sense to put a bi-di lane on Observer Hwy but it makes no sense that there is a bi-directional bike lane on Washington. There should be a one-way protected path on each side of the street. Besides conflicts with transit as others already pointed out, the intersection of the 2 bi-di lanes creates an unnecessarily complex intersection for cyclists. There are so many movements in such a tight space that they aren’t all accounted for, either at all or enough. For example, if you are coming down Washington and want to make a left on Observer to get to PATH or NJT, there is no left turn lane or protected space to wait to turn. Any back ups of bikes yielding to cyclists heading west on Observer will end up in the car lanes. Of course, maybe they are just assuming a very low volume of cyclists. When Kenney was elected in 2015, he said his administration would complete 30 miles of protected bike lanes. Two years into his time in office, it already seems unlikely that he'll achieve his promise.